Many tech-savvy television fans have found digital set top boxes to bring streaming programming to their large screen televisions. At $99, Apple TV lets viewers stream their iTunes purchases in 1080p to their television. Users can also stream items from the iPads, iPhones and iPods using AirPlay. Roku has a variety of products including the Roku 3 which brings a variety of streaming services and viewing options to the family television. The Roku 3 (their top model) is also $99. Today, Google decided to get into the set-top-box streaming game with the introduction of Chromecast for just $35! From everything I have read, the Chromecast device simply plugs into a HDMI input on a television and using the household's wireless network allows for streaming from a variety of devices (including Apple/iOS devices). This means users will be able to stream items from the iPhones (including using YouTube and Netflix Apps). An initial offer from Google included three free months of Netflix with the purchase of the Chromecast device (which would have brought the cost of the device to around $12). This offer was quickly "yanked" as the product appears to be so popular just 24 hours into its release. At this time I do not own any of the devices, but I am intrigued by the Chromecast. My main television does have the ability to do some wireless streaming (mainly Netflix). I also have an XBox 360 attached to it, which allows for some streaming (but is tedious and requires an XBox Live Subscription). In my bedroom, a wireless DVD player does some streaming as well. 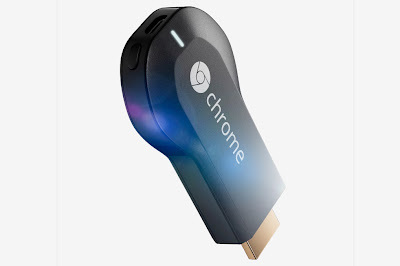 I like the idea of being able to stream anything from any of my devices using the Chromecast. Just the other day I wanted to show a YouTube video on my large screen television and it became a pain. The Chromecast would have been great to have on hand! If you would like a little side-by-side-by-side comparison of each device here is a pretty good article. I am leaning toward the Google device, but I hear Apple TV is pretty good as well (and I do own a few Apple devices). Happy viewing! Thanks for the info Mike! We are looking at getting a decent antenna for local channels and some sort of streaming device for everything else...now we have a third streaming choice. I do need to update my household wireless router first though....it's an old "g" router and not a very big bandwidth, so my research told me that it would probably get hung up alot and be very slow. The one time we tried it with the PS3 it was barely functional, so I think it was the router issue. I hear you Michelle. I keep trying to cut my Comcast bill, it's a never ending struggle. I updated my router last year and love the new model. Love the ability to have "guest" access as more and more people come over and ask for my wifi. When you buy a new one look for that feature. Have you learned anymore about this chrome device? We are deciding now what streaming device to purchase. We have a PS3, but also found it cumbersome and SLOW to stream with. Also, Mike won't keep it out, doesn't want kids messing with it, it had been his brothers before he passed away. Might consider one of these for a second TV if it's worth it, because there isn't much room for devices on the kids TV's, but they do have an extra HDMI port. I think this is easier to get now. I know you went with a different streaming choice but I may give this one a try.